Why is TranscriptionStar the better choice for captioning your Wistia videos? 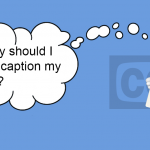 Before we dwell into that, let’s first have a brief on why captioning is important for you. “It’s about time you got your videos captioned”, says John Murray, a podcaster based in New York. About 18% of Americans are hard of hearing or deaf, and everyone should be able to experience your videos to the fullest. Also, you need to make your video contents accessible to all on the web; that is, people who need a little help with the language, someone who is traveling and would rather read along than strain to listen to the audio amidst noisy surroundings, and so on. Apart from assisting your viewer, by captioning the audio you also make your video contents trackable via Google search (that is, you make your videos SEO friendly). So, go ahead and caption your videos. First let’s look at the ways you can caption your Wistia videos. When you are a regular uploader, you would want to work with a professional transcription company. It saves you a lot of time on the transcription side. Transcription companies make use of proficient transcribers. Moreover, the companies are also capable of breaking down your videos into multiple sections and getting individual sections transcribed by a different transcriptionist, this way you get your transcripts in a surprisingly short durations, which would otherwise be impossible. Because of the same, you will be able to have many of your Wistia videos transcribed in the time you would usually take just for transcribing one video. So, despite seeming to have reduced a lot on your workload, working with a transcription company still doesn’t make you completely free to carry on your passion of creating and publish Wistia videos. Or you can either choose to personally listen to the audio and write down the transcripts or make use of an audio to text converter tool. However you cannot solely depend on the tool for accuracy. It would require you to make the final edits before submitting the content as captions. But, if you are doing it manually, it would take a lot of time. Which means, for regular uploaders, captioning would become an additional task amidst your already demanding video creation processes. You can either get free or paid tools. But no matter, they cannot give you human level accuracy. That’s because of these factors. That is, automated tools simply cannot cope with background noise, music and/or any other sort of sound effects included in the videos. As long as the speaker has a neutral accent, you are good, but the more accented his/her speech is, the more errors you would have to be correcting. There’s no denying that speech recognition tools (many are available for free and many more are available for a fee) have come a long way; but there’s also no denying that none of them (neither paid nor free) can differentiate between multiple speakers! 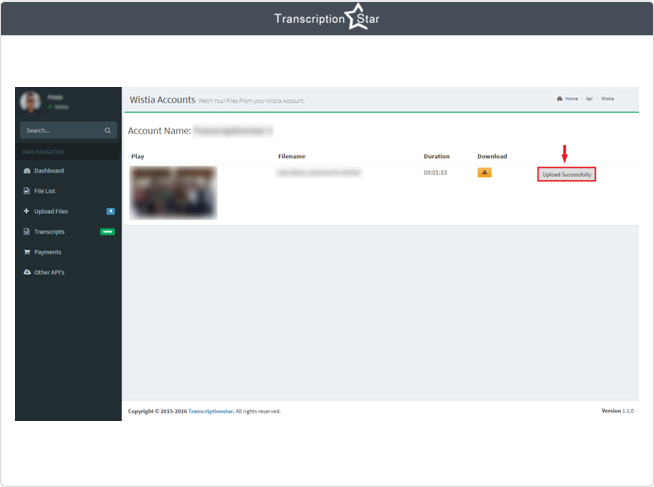 TranscriptionStar; where other professional transcription companies’ falter we provide solutions in the form of our all new and upgraded iTranscript platform. 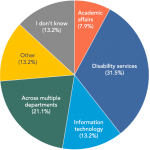 You enjoy all the benefits of working with a transcription company, but, minus all those cumbersome processes. 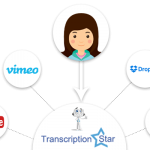 This single platform will function as your one-stop port for everything including marking, tracking, and having your videos transcribed without having to do anything other than selecting and confirming. 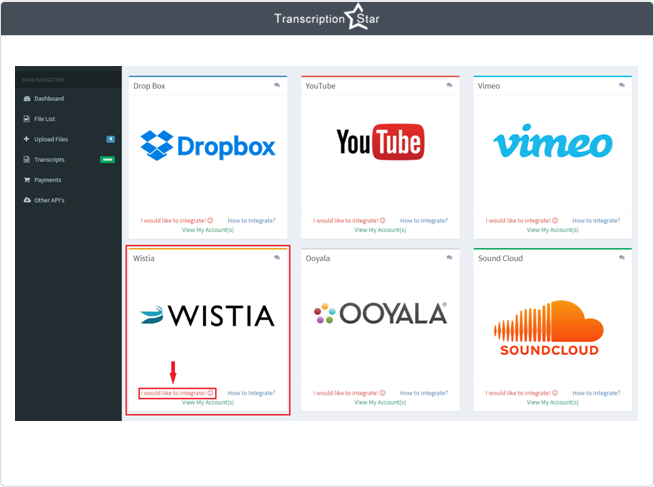 To explain: Via iTranscript platform you link your Wistia account with TranscriptionStar’s. Now all your Wistia videos are listed out in iTranscript. All you have to do now is scroll through this list and select the videos that you want captions for, and simply click on confirm. That it! Our certified transcribers will be transcribing your Wistia Videos and make captioning easy for you. You no longer have to bother with uploading your videos to the transcription company, or worry about sending sensitive data via tentative 3rd party file sharing services. All your data are transferred via the platform’s secure interface. So, once you have confirmed the videos that you want transcribed, you should immediately be able to track its progress. Also you can make payments through the same platform, no fuss, just choose your preferred and secure mode of payment (PayPal, Credit Card, etc). And, once your files are transcribed, you will be alerted via your email as well; all this, with just a couple of clicks. How to Simplify Closed Captioning Workflow?